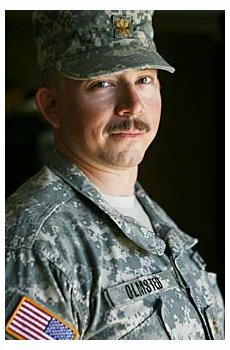 In an earlier post I linked to the story of Maj Andy Olmsted. He was killed by sniper fire in January in Iraq - the first US casualty in 2008. Months previously he had written a blog post to be published in the event of his death. BBC Radio Five Live's Pods and Blogs programme has interviewed Hillary Bok, a fellow blogger on the site Obsidian Wings. She published Andy's last post. You can listen to the interview here. The piece begins at 27 mins 30. If you haven't read the original post you can find it here. It really is quite extraordinary.